Vilnius hides a host of surprise discoveries, something for everybody: all different and unique. Vilnius is currently one of the most visited cities in Eastern Europe. It draws attention not only because of its unique architectural character, but also by its cultural events and attractions. Lithuania will hold the Presidency of the Council of the European Union in the second half of 2013. Vilnius, as the capital of Lithuania, will hold numerous events and activities during Lithuania‘s presidency of the EU - including the IASA-BAAC conference. October in Vilnius is also famous for the International Theatre Festival "Sirenos". 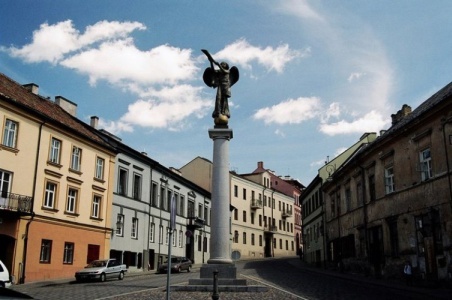 The historical centre of Vilnius, the Old Town (Senamiestis), is one of the largest old town centres in Eastern Europe (covering almost 360 hectares). The Old Town is situated in a picturesque valley at the confluence of two rivers – the Vilnia and the Neris, at the crossroads of trade roads, next to the ford which was guarded by Vilnius Castle in olden times. Vilnius International Airport is located within easy reach of the city centre. The airport has its own tourist information centre. Vilnius city centre can be reached from the airport by bus number 3G, which runs every 5-20 minutes, and the journey takes approximately 20 minutes. The Old Town can be reached from the airport by bus number 88, which runs every 20-40 minutes, and the journey takes approximately half an hour. The city centre or Old Town can be reached even faster by taxi. Use the taxi booking service at the Vilnius Tourist Information Centre in the arrival hall of Vilnius International Airport. You will get customer-friendly fares: there is no booking fee. You can also get a taxi at the taxi rank in front of the arrival hall, but be aware that the fare will be higher than with pre-booked or phone-booked taxis (see more information about taxis under Transportation below). The conference venue is shown here. 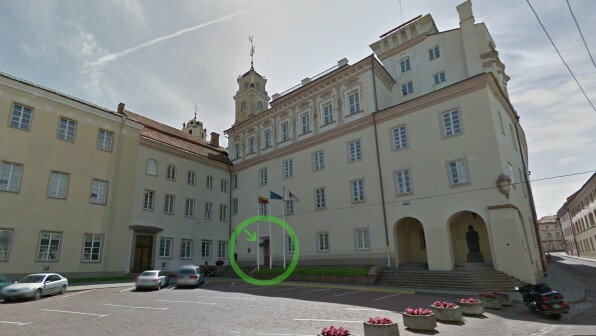 The Registration desk is at the main conference site in Vilnius University (Address: Universiteto str. 3). The desk will be open between 9:00-17:00 Sunday through Thursday. Please follow "IASA-BAAC Conference" arrow signs from the main entrance, shown in the photo below. Vilnius trolley buses and buses start running at 5 in the morning and stop at midnight. A single ticket for either bus or trolley use (same ticket works for either bus or trolley) costs 3.50 LTL and you must buy it from the driver. Paper tickets need to be stamped when getting on the transport, by putting them into the tiny red machine near the driver and pulling the rear part towards you to punch the ticket. It is highly recommended to buy the ticket, because the controls are regular, especially at the beginning of each month. An e-ticket is also available (Electronic ticket, “Vilniečio kortelė“). For the first use it is necessary to buy a card. The card can be used both for single and monthly public transport tickets. E-ticket must be credited with an appropriate amount of money and/or the selected public transport tickets. With a valid ticket in the card, properly activated on board the public vehicle, if necessary, it is possible to change the public transport for free and for unlimited number of journeys. A 30-minutes ticket costs 2.20 LTL and a 60-minutes ticket costs 3.20 LTL. Available short visit tickets are one-, three- or ten-days. These tickets are available at the following kiosk in the Old Town: Gedimino Ave. 9A (kiosk in the V. Kudirkos Square). Two environmentally friendly bus routes run in the Old Town of Vilnius city - No. 88 and No 89. A regular cab may cost about 15-20 LTL (or about 3 LTL per kilometer) if you need to get from periphery of the city to the center. You should always call a taxi by phone, even if you see a taxi on the street nearby. Street taxis charge as much as twice the price of taxis called by phone. A good practice is to dial the number written on the vehicle you see, tell the dispatch the address you are at, and you will most likely get the same vehicle for a fair price. Taxis in Vilnius can be identified by special taxi lights on top of the vehicle and yellow license plates. Taxis must be equipped with a meter, and the price per kilometre must be clearly displayed. Tip: when stepping into a taxi, make sure that the meter is turned on. The weather in Vilnius is humid continental. The beginning of October is usually sunny and warm, and temperatures may rise up to 15°C (59 °F) during the daytime. 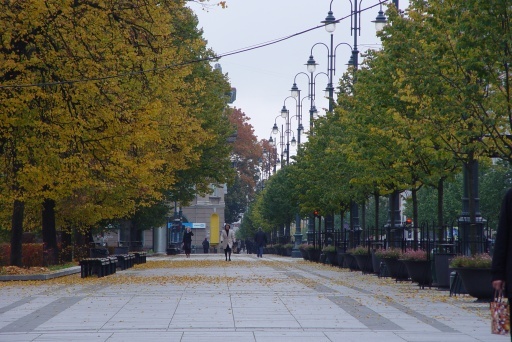 Autumn is a very picturesque season in Lithuania when leaves change colour from green to yellow. It is however soon winter, so please do expect cool mornings and evenings and occasional rain, and plan on bringing some warm clothes. The national currency is Litas (LTL). The Litas is tied to the Euro with a fixed exchange rate of 1 EUR = 3.45 LTL. A typical currency exchange fee is about 2-3 LTL. Lithuania has an extensive e-banking system; almost everywhere credit and debit cards are accepted, and many ATMs are located in and around the Old Town. Banks are open during weekdays, but in the larger shopping malls, you may find some banks that offer services seven days per week. You can also use ATMs located in banks 24 hours a day. Over the centuries Lithuanians have created a unique palette of dishes, influenced by the culture of various nationalities. A distinctive trait of Lithuanian cuisine is the emphasis on potato dishes. The most impressive of these is “cepelinai” (‘Zeppelins’), large boiled potato dumplings (made from grated raw potato) with fillings of minced pork meat. Also popular are various types of pancakes made from flour or from grated raw potato and small dumplings called 'koldūnai'. International cuisine is predominant in the Vilnius restaurant scene, with a few Lithuanian dishes included in the menu. Pizzerias now outnumber Lithuanian restaurants, so do not be surprised to find a wide range of pizzas available at most restaurants. Vegetarians should be able to find a suitable dish on the menu of almost any restaurant. Cafés (or tea houses) can be found in almost every street of the Old Town. The largest number of cafés can be found in the Vilnius-dwellers favourite streets: Pilies, Didžioji, Vokiečių, Trakų and in Gedimino Ave. Traditional Lithuanian souvenirs are various amber products or unpolished pieces of amber, linen textiles, ornaments of silver, bronze or copper, leather goods, clay vessels, and other. They can be purchased at craftsmen’s workshop-galleries in the Old Town, in the little open air market on Pilies Street or in souvenir shops (Pilies, Didžioji St.). Very popular handmade ceramic crafts and home accessories can be purchased at “Interios” shop (Pilies St. 14 and Didžioji St. 8). Some local food specialities are black rye bread or wheat bread, pastry ‘šakotis’ (layered festive cake – like German “Baumkuchen”), and Lithuanian cheese “Džiugas“ . All electrical appliances (hairdryers, razors, irons) run on 220 volts; otherwise these require an adapter. Please note that hotel rooms in Lithuania are usually already equipped with a hairdryer. The emergency number for police, ambulance, fire brigade and other rescue services is 112. The call is free of charge. Operators speak Lithuanian, English, Russian and German. For medical emergencies, whether accidents or illness, the telephone number to call is 112. Be prepared to give clear information: your name, phone number, address, the nature of the problem and what kind of immediate assistance you need. Tap water in Lithuania is safe for drinking, however it is recommended to drink bottled water.